Born Madison, Wisconsin, May 15, 1951; married; 3 children, 2 grandsons. Graduate Sun Prairie High School, 1969; B.A. in Political Science, University of Wisconsin-Madison, 1973; Gonzaga University Law School, 1976; Bowhay Institute, 2008; Council of State Government 2018 Henry Toll Fellowship Program, alumnus. Attorney and owner of a title insurance company. Sacred Hearts eighth grade basketball coach, 1980–99. Member: Wisconsin League of Conservation Voters; Dane County Bar Association; Wisconsin Bar Association; Sun Prairie Optimist Club (former president); Sun Prairie Chamber of Commerce (former president); U.W. Flying Club (former board chair); AOPA; EAA Young Eagles Program; Knights of Columbus (fourth degree member); Sun Prairie Cable Access Board; YMCA (former president); Sun Prairie Public Library Board (former president); Sacred Heart Parish Council (former trustee); Sun Prairie Quarterback Club (former president); Major, Wisconsin Wing, Civil Air Patrol Legislative Squadron (official Auxiliary of the U.S. Air Force). 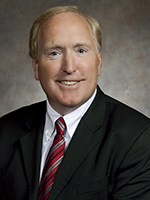 Recipient: State Bar of Wisconsin Scales of Justice Award 2009–10; Wisconsin Dietetic Association Nutrition Champion Award 2010; Pharmacy Society of Wisconsin Legislator of the Year 2010, 2009; Sun Prairie Star poll Best Attorney in Sun Prairie 2008–16; James J. Reininger Award for lifetime achievement 2008; Wisconsin Association of PEG Channels Friend of Access Award 2010, 2007; Wisconsin League of Conservation Voters Conservation Champion 2013–14, 2011–12, 2009–10, 2005–06; Sun Prairie Exchange Club Book of Golden Deeds Award 2003; Chamber of Commerce Judith Krivsky Business Person of the Year Award 2002; Sun Prairie Business and Education Partnership Outstanding Small Business of the Year 2001; Sun Prairie High School Wall of Success 2015. Elected to Assembly since 2004.